A long list of new topics awaits, but I feel the need to follow up on my last post and some comments/questions I received. First off, a reminder: Yidakiwuy Dhäwu Miwatjŋurunydja, the centerpiece of this website, represents as best as possible the consensus views of many in northeast Arnhem Land. Many Yolŋu people participated in or reviewed its contents. This blog, on the other hand, only represents the views of the author. Me. Last time, I discussed the common occurrence of non-Aboriginal didgeridoo events promoted with images of unrelated Aboriginal People and artwork. I want to reiterate that I first privately contacted the didge player whose event, promoted by someone else, inspired the post. He quickly resolved the issue. Yay. Thanks! Most of my prior experience with this issue has been similarly positive. A while back, another non-Aboriginal didge player sent me a draft poster for a concert & workshop with a giant picture of Djalu’ Gurruwiwi’s face on it, asking me how to get permission to use it. I told him that if Djalu’ saw the image, it would confuse him at first. As a teacher and performer himself, he would likely wonder why his face was used to promote an event he hadn’t been invited to teach or perform at. The didge player immediately understood that point and all its implications and changed the poster to something that more accurately reflected the event. Not everyone responds as well to such suggestions. I won’t go into detail and don’t want to open old wounds, but on another occasion, I tried to give a friendly warning to someone who used an image of an Aboriginal didgeridoo player without permission. My suggestion was ignored. Later on, that Aboriginal man saw the image and some other inappropriate behavior on the same website. The ensuing scandal escalated to the point of death threats and coverage by Koori Mail, Australia’s major indigenous newspaper. So even if you disagree with my posts on this subject and correctly refuse to take my word as gospel, please be humble and try to understand the feelings of Aboriginal People. 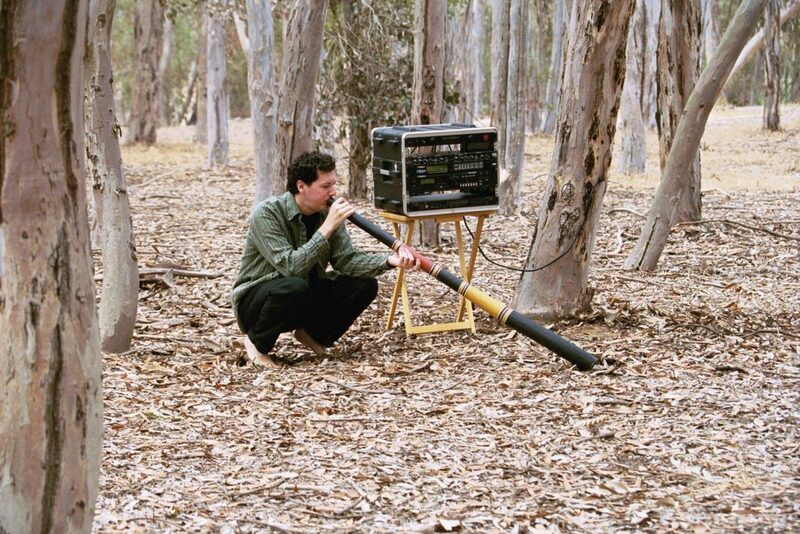 Most didgeridoo players claim to have a deep respect for the origins of the instrument. If your activities with it might inspire death threats from the instruments’ origins, then perhaps you should reconsider what you’re doing and humbly correct yourself. Again, I don’t bring this up to shame the parties involved years later, but as a clear example we can all learn from. Other factors contributed to the size of the scandal, but it began with an Aboriginal man finding his image used without permission by non-Aboriginal didgeridoo players to promote themselves. So no one suggests, “white didge players should never under any circumstances post pictures of Aboriginal People.” You just need to be smart and sensitive about it, and weigh whether you’re promoting yourself or advocating for them. After my post last week on this subject, a non-Aboriginal didgeridoo seller asked me if the images he used in his promotion were appropriate. He took them on his own visits to Arnhem Land. Among other products, he sells authentic instruments from Arnhem Land. As long as the use is tasteful, I think this is entirely appropriate. I only suggested that he add more information. Something like, “this is _______, a yiḏaki artist I met while visiting in 2010.” This acknowledges a real person, rather than using the image as anonymous clip art. It provides an example of a didgeridoo player who made the effort to go the instrument’s origins to learn. That’s good. Yolŋu want us to learn from them. Perhaps ironically, when I posted that last blog, a flyer was circulating for an event I was involved in, using an image of me with a Yolŋu person. I’ll share my rationale for the use of that image. It’s all about context. It’s 2004. 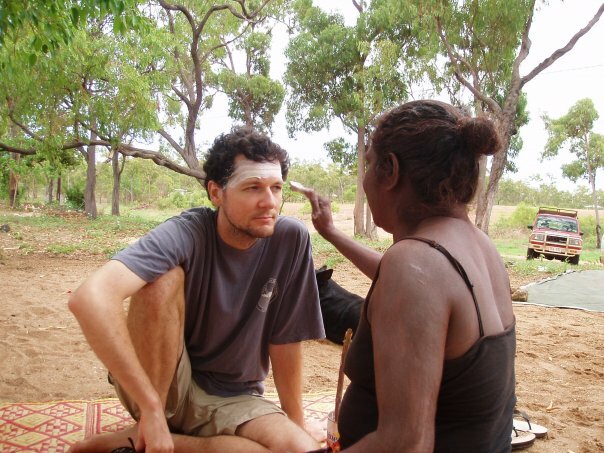 I had only recently arrived to live in Yirrkala. My adopted Yolŋu brother, going back to my first visit in 1999, passed away. In the photo, “my daughter” Gayili is painting me for part of the funeral ceremony. On a simple level, the image shows that I have some connection to Aboriginal culture, so in that regard, it works as self-promotion. On a deeper level, I use it because it shows me sitting down, humbled, in a setting where I don’t really know what’s going on, but am being brought in to learn. It shows that I am the student, and the Yolŋu person is the teacher. That’s the spirit I use it in. When advertising a yiḏaki workshop, my show A Personal History of the Australian Didgeridoo, or anything that focuses on education and advocacy, I use this image to communicate that the event is about listening and opening up to learn about Yolŋu culture. I do more education than performance these days, but when I do perform, I never use the picture with Gayili. To promote a concert of my work Didgital late last year, I used this pic of me from the album cover shoot. There’s a clear distinction between me doing my own thing and me as student of Yolŋu culture. In conclusion, this follow-up adds a little more open discussion about context to the previous post. I see how the last post could be interpreted as, “don’t you dare use photos of Aboriginal People!” I don’t want to come off as too strict or to discourage people from sharing images of their own experiences in Arnhem Land. Just consider the context. Do you feel you have the right to share the image? Would you do it if you knew the pictured Aboriginal Person was going to see it? Are you only promoting yourself or are you promoting Aboriginal People and culture? Glad you are staying on top of this.